I feel like writing about Old Oakland for a bit. This is something I'm asked often, "Where is Old Oakland?" Well, it's technically part of West Oakland and sometimes called Downtown Oakland. It's borders run from 6th to 11th Street and Broadway to Martin Luther King Way (Grove). *History Nerd Alert* Old Oakland was formally the original Downtown (1860s) and the location of the first City Hall (we're on our third) and was a thriving commercial district for decades. Eminent domain by the City or really, the destruction of the residential community (50 blocks) in West Oakland in the late 1960s and early 1970s caused the decline of many of the commercial areas of interest. 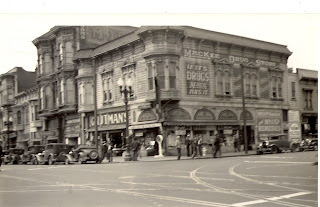 Slowly, Swan's Department store, many other businesses and then Housewives Market came to an end in Old Oakland. There was the restoration of the old Victorians around 8th and Washington in the late 1970s that remained empty for years and the 1980s and 1990s proved to be a difficult time for the area. As much as I love my beloved Old Oakland, as a teenager I wasn't allowed to walk around these parts, it was a haven for criminals and drug addicts alike and when the dark and frightening image of Downtown/West Oakland first reared it's ugly head. My mother, Nati Ramos, was literally born in this neighborhood. The midwife helped my grandmother give birth at the family home on 4th and Castro in 1931. Mami talks about the old neighborhood as though it's a long lost friend and our business was located down the street on 7th and Castro. She has a map in her head where she remembers where every family's home was located before it was torn down and the freeway overpasses where built in their place. She talks longingly of how she grew up during the Depression yet no one realized their family was poor since everyone worked hard and took care of each other simply because that was the right thing to do. My family chose to keep our business, La Borinqueña, in this area at our present location on 7th and Jefferson but remembers telling people to simply park outside and run in to buy their tamales, tortillas and pan dulce and NOT wander the neighborhood since it really was scary. The Loma Prieta earthquake and then the storm El Niño truly kept us on our toes as small business owners and wondering what kind of disaster, natural or created, was going to hit us next. By this time, I had returned to working full time at our business and I was really questioning what I had gotten myself into. 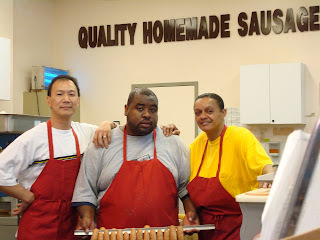 I decided I wanted to be part of this neighborhood and see if the potential of a real community existed. I longed to know what my mami remembered and if a different version could happen again. Before the condo buildings making up the "New" Old Oakland were built and pushed property taxes upward, I moved in at the end of 2000. My entire family including my own mother though I had lost my mind and questioned why I would want to live here. "CRAZY", they would all say to my face and I didn't care. The change was near, the renaissance promised decades ago by City planners and I wanted to see it for myself. Even the police in their patrol cars wondered what I was doing roaming these parts, alone most of the time, and followed me until they realized this neighborhood was both work and home. They would watch me skip up the steps, put the key in my house door and wave once I headed inside. I knew the change was here when I mentioned where home was and the question changed from, "Why do you live there?" to "How cool, that's where you live?"